The standing desk – such a disruptor. Or so you think. Over the past ten years, standing desks have become more and more popular, partly because they’re so different than the cubicles most office workers are used to, but also because studies have shown that sitting for long hours during the day is literally hazardous to your health. But here’s the catch: People have been using standing desks for hundreds of years. Thomas Jefferson himself was a proponent of the standing desk. The study of the standing desk is fascinating because some well-known historical figures loved them, and because it reminds us that historical trends often repeat themselves. We’re going to spend the next two posts talking about how standing desks came into being. In this post, we’re going to cover what a standing desk is and how it started. The simplest definition of a standing desk is one that’s tall enough to where you need to stand in order to use the desk. 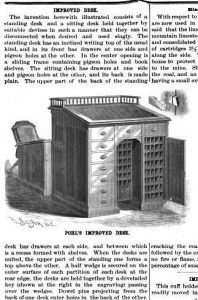 Functionally speaking, there are drawings dating back to the 19th century that show a lectern-style desk with multiple compartments. Today’s standing desks are starkly different, often using minimal frames designed to give enough desktop space to fit a monitor, a keyboard and a mouse pad. Other modifications include extension platforms that can be placed on top of a traditional desk. These sit-to-stand style desks can accommodate multiple work positions. Perhaps the key feature to any standing desk is adjustability, a cornerstone word when it comes to the modern workstation. How Did Standing Desks Start? It’s hard to nail this one down, as the exact origins of the standing desk could’ve started thousands of years ago or just a few hundred years ago. The office chair, we know, was first implemented back in Egypt during the era of the pharaohs. So, we won’t go as far as to say that the standing desk was invented in the United States, but we know it was certainly popularized here. As we mentioned earlier, Thomas Jefferson was a huge fan of the standing desk. But he wasn’t the only one. Statesmen and authors from both sides of the Atlantic loved using the desk for their writing. “Historically, standing desks were used by famous figures such as Thomas Jefferson, Charles Dickens and Winston Churchill,” Soloff wrote. Soloff wasn’t the only one to pick up on the rich tradition of standing desks, though. Their post pointed out that much of what we know about standing desks in history is included in archived books available on Google. The standing desk was also a favorite of Prussian Prime Minister Otto von Bismarck, the McKays explained in their Art of Manliness post. “Prussian Prime Minister Otto von Bismarck would be standing at his desk by five in the morning, ready to sort through all the proposals and business of the day,” they wrote. Do the Science and Anecdotes Prove Standing Desks Are Better? With the historical origins of the standing desk nailed down, it’s time to start asking the pertinent questions about function. With so many examples of productive men using standing desks, should you consider using them at work? Is there any science behind the popular notion that standing desks are healthier and may make you more productive? That’s what we tackle in part two of our series on standing desks.